About once a month, my husband and one of my biggest fans, ends up ‘selling’ a spot to my creative retreat. He will tell me, “I found someone who wants to attend today.” Which is great, except the problem is, I have not created a retreat yet. But, somehow he manages to capture my intent, what a retreat could be like and recruit like-minded women who want to be there with me. I have humble goals. Maybe I can get a dozen friends and family to travel to Vancouver and partake in an event, a retreat, a weekend, whatever it ends up being. Sometime in the fall of 2018, when we are back from this travel year. My husband thinks that is a very small target and far too modest. He thinks the interest will be far greater. Maybe. What I know for sure is, neither one of us will have guessed properly if I don’t take the next step. I want to create something that serves women, like me. I’m a person who has spent a bunch of years working for other people in a typical corporate environment. (I wrote a post about why I left that gig). Now I want to do something different, something for myself, but maybe more importantly I envision a business which helps other people. Even more specifically, I believe that tapping into our inner wisdom, our creativity and other latent talents is how we will be more successful and lead happier lives. I think we can all practice a greater degree of this, no matter what our current circumstances are. I am hoping for a visually inspiring space to come together and share best habits, learning from each other. I think connection and community around shared goals, working creatively together, is a difficult thing to find. There are a host of events which cater to one topic, but not so many where we can broadly explore our interests. I want our curiosity to be the guide and lead us to where we are naturally inclined, as we would have done as youngsters. For some of us, it has been a long time since we were allowed to just play in this way. I am hoping we can put down our shields of armour, leaving them at the door, along with our insecurities and fear. Instead, pick up a badge of vulnerability, with our lovely name on it, where we can roam freely, without judgement. I don’t want a bunch of rules and strict commitments. I would love to see a more organic experience. This may sound a bit too hippy like, for some people. I know there are those among us who like events to unfold like clockwork. Of course, there does need to be some guidance in that area, otherwise we wouldn’t all know where and when to turn up! In order to gauge interest and guide the development process, I would love some help in defining what is most important to you in a creativity retreat. Even if you have never thought of attending something like this, I bet you have some thoughts about what interests you. I have a few ideas to get us going and then it would be much appreciated to add your voice to my short survey. If I have not covered everything you might wish to see, please use the comments in the survey to explain further. Or shoot me an email, I’m easy to reach and would love to hear from you. Let me explain this graphic a bit. First, I love the artwork on this cup! Besides the point, I know. Seriously, though, it is important to surround ourselves with people and things which inspire us. It doesn’t have to be a physical item, but could be a location, a memory, music, etc. In this example, I have my creative cup in the middle of the picture. Then, I am showing all the ways I can fill this cup up. This is how I replenish my creative self, how I derive inspiration. It is my centre. Where I need to come back to, when life gets a little crazy. It is ever so important to keep filling this up for it can never be too full. There are always forces at work, or little holes in the bottom, which conspire to empty this cup. Learning – this is research, reading, taking courses, investigation, asking questions, exploration. So important for me. I can’t live a day without learning something. A retreat is a giant learning experience, but each person absorbs and incorporates information differently. How we learn best, is the important question here. Self-care – ‘put on your own mask first’, we cannot help others unless we take care of ourselves. Some women are really bad at this because we are prone to self-sacrifice. This is where a spiritual practice might be important, or meditation and even exercise. It is also, the myriad of small ways we act towards ourselves. Do we think kind thoughts of ourself? Do we take care of our physical bodies? Do we take care of our minds by getting enough rest? There are so many ways we can elevate our level of self-care. Even getting a massage every now and then. Which practices are important and where does your curiosity lead? Connection – have we built meaningful relationships with our favourite people? These take work. It is a 2 way street and we need to do our part, but the reward is great. Do we express love? Are we able to step up to the plate and show empathy when another close to us is suffering? Are we serving others? Are we helping to build strong communities? Are we comfortable at reaching out and asking for help? Making – or hand work. This is probably where most people think creativity is solely expressed. While creativity lives here, it is not the only place. Some would argue knitting row upon row of an endless and intricate lace scarf is drudgery, rather than creative. But working with our hands is very important for our creativity in all aspects of our life. Even doing things like gardening, sewing, styling hair, applying makeup. Different kinds of art and design are inherently creative. Anything we use our hands to do, in a rhythmic and purposeful way. Travel – for obvious reasons opens up the mind like no other activity. But this does not have to be expensive or far-flung. It can simply be getting out in your community for a walk. It is the change of scenery and letting your mind make new connections as you move about. This could even be window shopping. Or letting your mind wander, while commuting on a bus or a train. 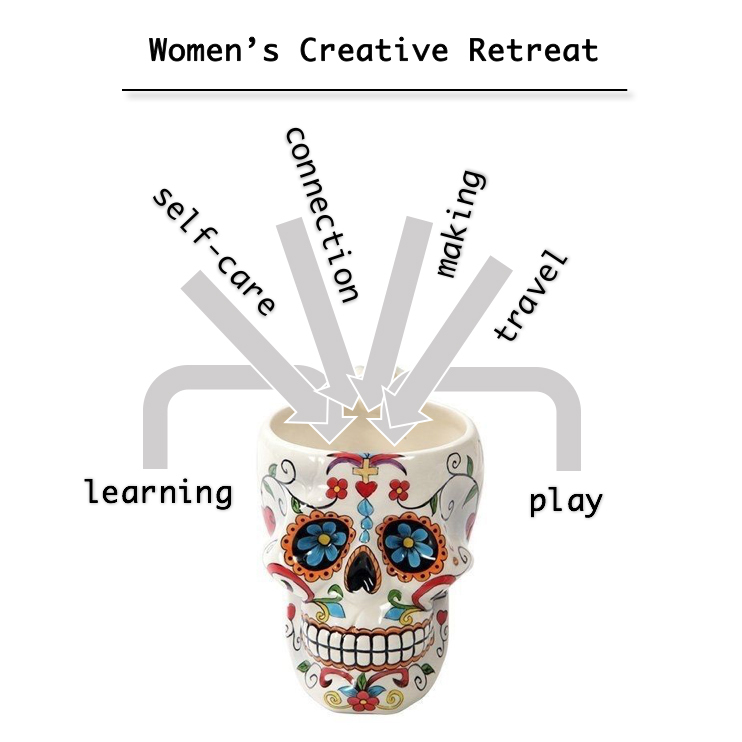 Travelling to a retreat, even if it is relatively close by, is a great creativity primer. Play – something most of don’t do enough of. Another great way to unlock creativity, it is socially fun as well. Games, dancing or telling funny jokes, the ways we can play are endless. I personally could understand this angle far better than I currently do. At the bottom of the cup are the pesky, leaky holes. It is important to manage that side of things, as well. But, I like to make the fun, happy and good parts take centre stage. Then, when those aspects of life are being built up, I find more energy to direct towards the realities of life which are draining. For if we focus on the negative side first, our cups will still be empty and our mood might be worse than when we started. Now it is your turn! Please head over to the survey and let me know your thoughts! I get really excited by this kind of stuff and I hope you do too. Along with the 6 objectives described above, what goes without saying is yummy food, a supportive vibe, a relaxing atmosphere and lots of smiles and laughs. This need not be so serious, it should be fun! After all the survey responses are collected, I’ll be looking for patterns. I’m hoping there will some consistency or a red thread that I can use to connect the expressed ideas together. Once I have completed that, I will get to work on developing what the structure of the retreat could look like. Stay tuned, I’ll be posting here regularly on my progress! Your ingredients for a creative retreat sound like the perfect recipe. I wish I could find a group of gals in my community who would be interested in joining me for such a retreat. Or maybe even a virtual retreat with a group of virtual friends. Sadly, most of my friends do not enjoy creative endeavors. Leslie – finding our way back to our creativity is the thing. I think my idea needs to focus on teasing that out of anyone who dares to search for it. Building a tribe of like minded women is what I hope for as well! Stay tuned, subscribe and all the news will come to your email as I make progress.